It shares some technology with the respected A7X, but the largest in Adam’s F-series of monitors is much more affordable. With 32 analogue I/O, MADI and ADAT in a 1U format, this Antelope stands out from the herd! MIDI Designer Pro control surface and The Wablet Synth app for iOS. This optical outboard compressor is cheaper than some plug-ins. What’s the catch? Meet the monitor controller for the DJ, musician or engineer on the move! Dave Smith’s latest synth crams four Mophos into one keyboard-shaped box. The result promises to be more than the sum of its parts. Digico's latest product should appeal to anyone wanting to achieve high channel counts in music-production facilities, as it enables you to add up to 48 channels of MADI-format digital I/O to a Mac or PC via USB. A suite of plug-ins from Russian developers DMAX takes an unorthodox approach to mastering processing. Do these DSP-equipped speakers from Dynacord’s new A-Line series sound as classy as they look? Sound designers Daniel James and Aaron Frensley are the duo responsible for creating Project Alpha, a sound-design toolkit for cinematic music projects. Computer recording technology is now very mature, but many people still prefer to work with traditional mixing desks. So why not get a desk that fully integrates with your computer? Here’s our pick of available options. Native Instruments’ latest plug-in suite aims to provide the classic Lexicon reverb sound at a budget-friendly price. Coaxial monitors are usually expensive, so how do these budget offerings from French company Prodipe perform? Reason has evolved in splendid isolation from other production tools, but version 7 sees Propellerhead build bridges to the outside world. In the latest version of their flagship post-production software, Steinberg have applied some clever lateral thinking to loudness metering and ADR recording. The compact UR22 offers 24-bit, 192kHz recording, a bundled version of Cubase, and a very reasonable price: what’s not to like? Synthogy capture one of legendary pianist Glenn Gould’s favourite instruments. TC’s latest processor makes it easier than ever before to manipulate the sound of your voice. 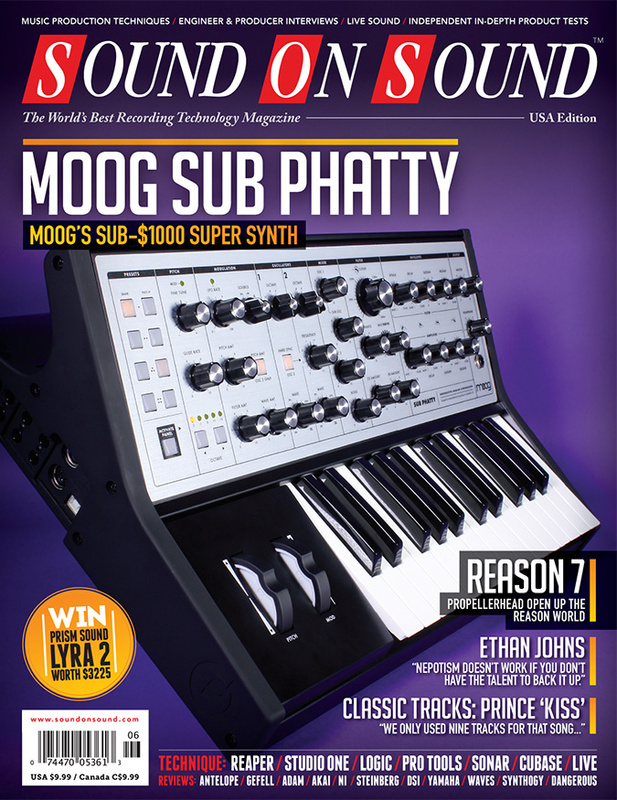 Ueberschall's original Elastik-based Indie Rock library got a five-star review back in the January 2012 issue of SOS. A year or so on and the company are back with a follow-up. The world isn't short of decent drum libraries, but it never hurts to have more sounds available. Marketing hype or a marriage of convenience between Audio-Technica, who provide the headphones, and Vox, who provide the guitar amp modelling? Yamaha’s new entry-level electronic drum kit is easy on the wallet, but aims not to compromise on sound quality. Is it a hit? Sometimes Pro Tools needs a helping hand with finding files and collecting them together. We get hands-on with the new and improved features of Live 9. Acoustic guitars are central to many live performances, but making them sound good through a PA isn’t as straightforward as you might imagine. Find out how to make Sonar X2’s Console Emulator plug-in work for you. Using Cubase 7’s powerful new Chord Track, you can completely rework your existing compositions. Audio files to accompany the article. Mic choice and technique may be important, but the other half of the recording battle is working to make musicians feel relaxed enough to deliver a great performance. Learn to customise Channel Strip Settings and stamp your own sound on Logic! This month, Adele, The Script, Labrinth and for the classic mix we feature Christina Aguilera's, Genie in a bottle. Get the rhythm with Studio One’s X-Trem and pattern sequencers. Read more about To The X-Trem! Editor-in-Chief, Paul White discusses the click-track! Ethan Johns learned his trade from the best in the business, but it’s his own talent that has kept his production skills in demand. Nearly 30 years after they burst onto the scene, Bon Jovi continue to top charts worldwide. Dakhla, Gilli Moon, Matthew Gough, Phre The Eon, Ashley Reaks, Paul Thomas Butterfield, Andy Jones and the Norton Rockets. Originally intended for another group, ‘Kiss’ was quickly reclaimed by Prince when he heard David Z’s arrangement. Despite record company scepticism, the track became his third number one single and rejuvenated his career. Spare me the bonus tracks! Blake McQueen asks the question. Do they really add anything to the album or are they just fillers? Often overlooked, OS X’s humble Command-Tab functionality could significantly enhance your productivity. Intel Haswell on the way. The imminent release of Intel’s latest processor, Haswell, is expected to bring with it improved graphics and lower power consumption. If you’re looking to build a studio, there’s masses of information out there — but no substitutes for professional advice and experience. Q. How do I set the gain on my preamp and interface? Read more about Q. How do I set the gain on my preamp and interface? Q. Is my stage laptop causing PA system noise? Read more about Q. Is my stage laptop causing PA system noise? Q. Should we mic up the drums when playing live? Read more about Q. Should we mic up the drums when playing live? Q. USB, Firewire or Thunderbolt? Read more about Q. USB, Firewire or Thunderbolt? Q. What exactly is comb filtering? Read more about Q. What exactly is comb filtering? When clients have an instinctive reaction to the music they’ve commissioned, the original brief often goes out of the window. We take a look inside one of the world's top studios. Media content for the June 2013 issue.